Over the past 200 years, Western New York has been witness to the socioeconomic rise and decline of a mighty steel industry. Like other rust belt cities, Buffalo, New York, was once an incredible financial and manufacturing superpower on the Great Lakes. The steel industry of Western New York was a leader of the Gilded Age and the embodiment of the postwar American dream. It employed almost a third of the regional population—many of whom still live in the area. As time progressed, failure to develop and compete with foreign contenders ultimately led to the collapse of its steel industry. Former steel workers have fought to keep this regional history alive and have contributed to this book. 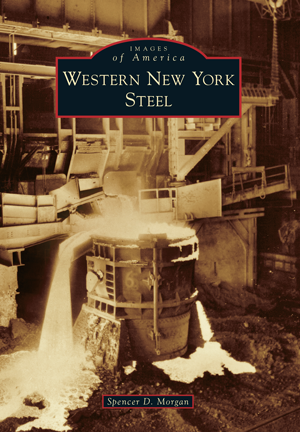 The Steel Plant Museum of Western New York, along with members of the community, have graciously assisted in the selection of images used to describe this once-great and influential industry. Spencer D. Morgan is the curator for the Steel Plant Museum of Western New York and is a lifelong Western New Yorker residing in Buffalo. Morgan is a graduate of SUNY Fredonia and Buffalo State College.